Friday April 12th 2019, Aman molli: workshop by Alexandros Papadimitrakis and Vanessa Kourtesi. Door opens at 19:30. Alexandros Papadimitrakis and Vanessa Kourtesi will be with us for a special workshop full of singing and music playing! In this workshop we will go on step further by practicing in parallel repertoire of east Mediterranean on vocals as well as melodically and rhythmically. In the end we will try to assemble all together! Don’t miss another unique opportunity! 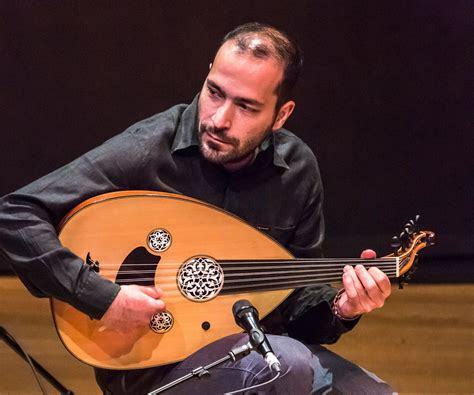 Alexandros Papadimitrakis teaches Turkish Music (Oud & Lavta) at the World Music department of Codarts university in Rotterdam. 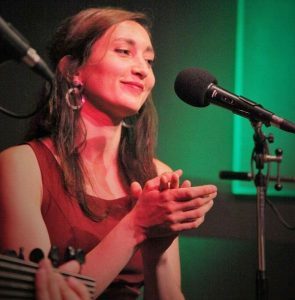 Vanessa Kourtesi is singing with the Serenade Ensemble, a group of five talented young musicians from Greece and Turkey. Alexandros and Vanessa have been actively participating in the Aman molli workshops and performed a few times at Joe’s Garage. Friday March 22nd 2019, Aman molli: singing workshop by Vanessa Kourtesi. Door opens at 19:30. Vanessa Kourtesi will be with us for a special workshop full of singing! Don’t miss this unique opportunity! Vanessa is singing with the Serenade Ensemble, who performed at Joe’s Garage last december 8th. Serenade Ensemble is a group of five talented young musicians from Greece and Turkey who all met in Codarts university in Rotterdam. Saturday 8 December 2018, Aman molli special concert with Serenade Ensemble. Doors open at 7:00 pm, concert starts at 7:30 pm. Bring your instruments for the jam afterwards! Serenade Ensemble is a group of five talented young musicians from Greece and Turkey who all met in Codarts university in Rotterdam. 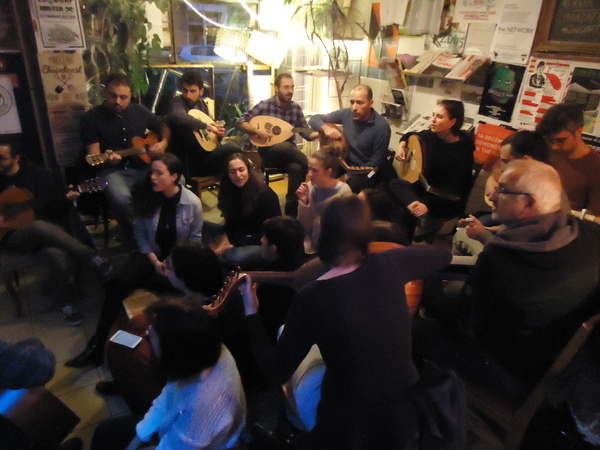 In this concert, they are going to connect the two sides of the Aegean sea by playing common songs that are widely known in both countries and there are lyrics in both languages. For example, in their repertoire is a song called “Tsakitzis”. Tsakitzis was a mythical folk hero of both Turks and Greeks in Asia Minor and in Istanbul. He was a rebel (just like Robin Hood), who, according to the songs and the legends, always defended the weak people and stole money from the rich people to distribute it to the poor ones (19th-20th century). 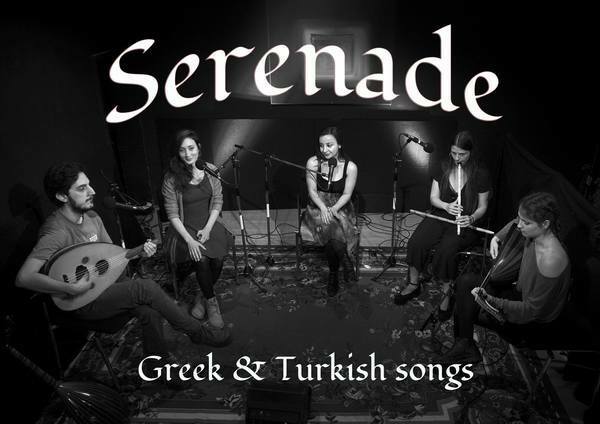 Serenade Ensemble is een nieuwe muzikale formatie bestaande uit: Duygu Alkan (zang), Dimitra Metzaki (oud), Andriana Petala Achitzanova (ney), Vanessa Kourtesi (zang) en Nikos Augoustidis (oud & zang). 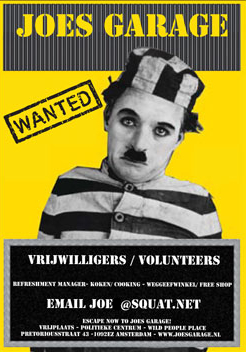 Hun repertoire bestaat uit Griekse en Turkse volks en klassieke liederen. Do you want to perform, play a concert at Joe’s Garage? 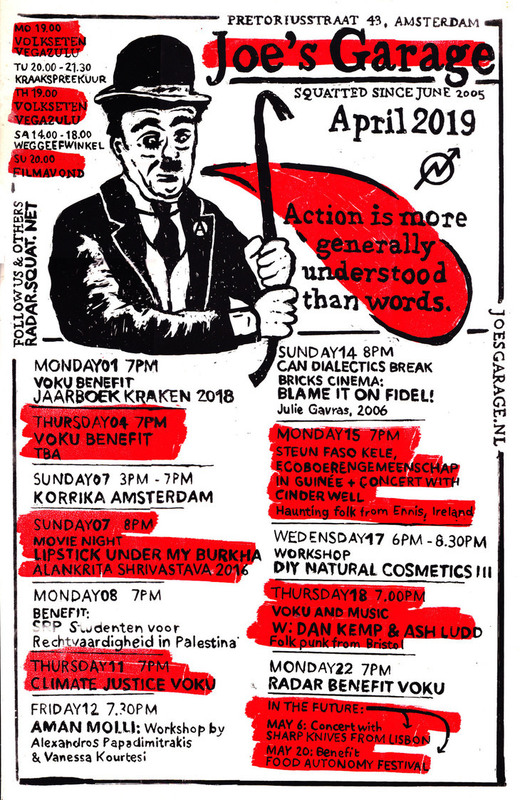 Please get in touch: joe [at] squat [dot] net, we are curious to read on your own website, not on corporate social media, where you have been playing in the past, what type of venues you are heading to. Friday 19 October 2018, Aman molli special concert by Michalis Kouloumis and Alexandros Papadimitrakis. Doors open at 7:00 pm, concert starts at 7:30 pm. Bring your instruments for the jam afterwards! After a summer break, the Aman molli collective is back at Joe’s Garage with a weekly workshop of Modal music every Friday at 19:30. This is an open collective workshop broadly defined as music following melodic pathways that are outside the two standardized Western scales and associated harmonies. The nature the workshop is sharing knowledge with each other about music, improve our skills on our instruments and of course having fun playing music together. Last modal music workshop Aman Molli of the season! Saturday 19 May 2018, Last modal music workshop Aman Molli of the season! From 7pm. This is an open collective workshop for modal music, broadly defined as music following melodic pathways that are outside the two standardized Western scales and associated harmonies.